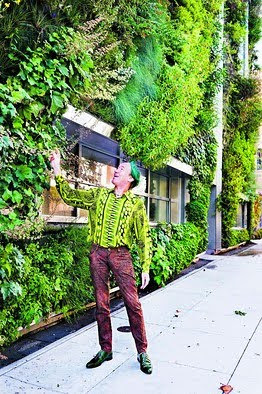 Maximizing Progress: Green Man ~ WSJ Spots Blanc's Garden Walls! "...the inventor of the vertical garden, also known as the living (or green) wall. [...] Among the more than 250 [garden walls] he has installed around the world, his most famous are at the Musée du Quai Branly in Paris, the Caixa Forum Museum in Madrid and the French embassy in New Delhi. [...] "My inspiration is nature," he said. Mr. Blanc himself resembles a tropical wood sprite. Nicknamed "The Green Man," he favors green shirts with bold botanical prints, green shoes and for the past 25 years has dyed his hair green because he likes the color. [...] In 1986, he created his first public vertical garden. His big breakthrough came eight years later, with his installation at France's prestigious Chaumont-Sur-Loire garden festival -- he had trekked to Chile to find plants there that might adapt to the Chaumont's climate."